Brexit and US-China trade negotiation were the two major themes last week. After a week of drama, it’s still unclear exactly what kind of Brexit deal would get through the Parliament. There’s some anticipation for UK Prime Minister Theresa May on her plan B on Monday. Yet she could fail to deliver again. Nevertheless, Sterling ended as the strongest one last week on perceived diminishing chance on no-deal Brexit. On the other hand, Dollar gained as there are signs of progress in the trade talks. Or at least, words from the US side were positive. The developments also lifted stocks and treasury yields. The US government shutdown is extending its record run with no end in sight. But it’s largely ignored by traders. New Zealand Dollar ended as the weakest one, followed by Swiss Franc and then Yen. It’s reported that the US is demanding regular reviews of reforms in China as the latter has history of unfulfilled promises. At the same time, tariffs threat won’t go away even if it’s a deal, to ensure thorough implementation of the agreed reforms. In particular, US is known to have heavy concerns over intellectual property protection, technology transfers, industrial subsidies and other trade barriers, rather than just trade deficit. On the other hand, it’s also reported that China is offering a six-year path to eliminate trade surplus with the US, by 2024. It stood at USD 323B last year. That is seen as doable on the Chinese side as they could just shift imports from other countries to the US. But that will likely be seen as inadequate by Trump and UTRS Robert Lighthizer. Their concerns are more on opening up market access in China, rather than just selling to China. Nevertheless, investors were happy with the “progress” so far as DOW ended up strongly again to close at 24706.35. 55 day EMA was decisively taken out. For now, as long as 24014.78 support holds, the rebound from 21712.53 should head towards 61.8% retracement of 26951.81 to 21712.53 at 24932.09. Or it could rise further to 78.6% retracement at 25820.34 before topping. More importantly, DOW is now back above 55 flat 55 week EMA. The development suggests that price actions from 26951.81 are just correcting the up trend from 15450.45, rather than the 10 year up trend from 6469.95. If that’s the case, the range of the consolidation is pretty much set. Optimism is also clearly reflected in the US yield curve. From 1-year (2.610) to 2-year (2.616) to 3-year (2.604) and 5-year (2.627), the curve is essentially flat, rather than inverted. 10-year yield also extended the rebound from 2.554 to close at 2.784 last week. Technically, strong support was seen from long term channel as well as 38.2% retracement of 1.336 to 3.248 at 2.517. Sustained break of 55 week EMA (now at 2.831) should confirm completion of the pull back from 3.248. And that should also confirm that the up trend from 1.336 is saved. Dollar index’s recovery from 95.02 extended higher last week to close at 96.33. The developments are turning positive for the index considering that it drew support from 55 week EMA. EUR/USD’s corrective rise looks completed earlier than expected at 1.1569. Similarly, USD/CHF’s corrective pull back is likely completed at 0.9176 too. 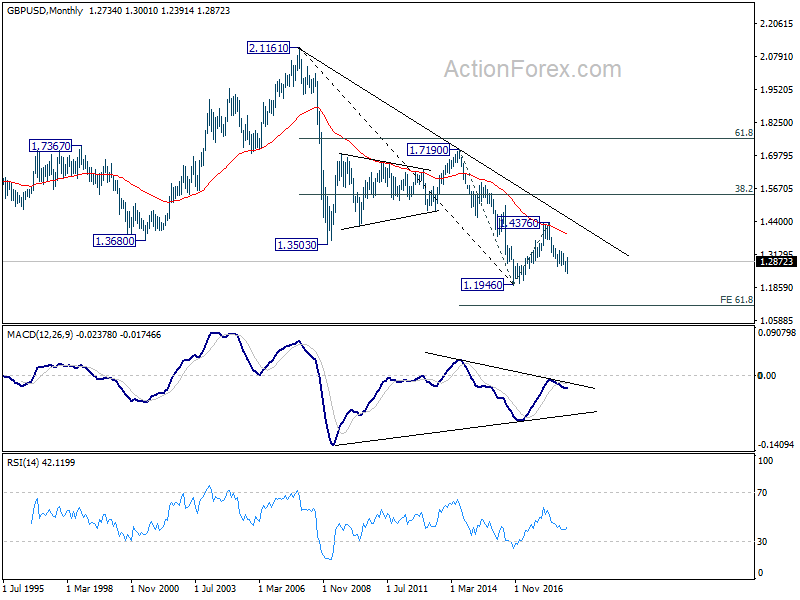 USD/JPY has taken out a key resistance level at 109.46. The above development, further rebound is both stocks and yield will revive the chances of Fed’s rate hikes in the second half of the year. And that should be Dollar positive too. Hence, we’ll pay attention to reaction from 55 day EMA this week. Firm break will bring retest of 97.71 high. But rejection by the EMA will extend the correction from 97.71 with another decline. After a week of Brexit drama, Sterling ended as the strongest one last week despite paring some gains on Friday. In short, UK Prime Minister Theresa May’s Brexit deal suffered historic defeat in the Commons on Tuesday. But she then narrowly survived the confidence vote on Wednesday. Now May is continuing with her liaison with UK MPs and EU to line up an amended deal. May is expected to table her plan B on Monday. The Commons has scheduled to vote on the amended motion on January 29. Domestically, there is no serious discussion between May and opposition Labour leader Jeremy Corbyn. Corbyn insisted that May have to take no-deal off the table, but May refused to do so because “it is not within the Government’s power to rule out no deal.” On the other hand, former Conservative Prime Minister John Major criticized that “Her deal is dead and I don’t think honestly that tinkering with it is going to make very much difference if any difference at all”. With the EU, it’s reported that May is repeating the same demand regarding the Irish backstop. Those include either a legally binding time-limit, right for UK to unilaterally withdraw, or a commitment to to a trade deal finalization before 2021. May has been in talks with h Dutch Prime Minister Mark Rutte, German Chancellor Angela Merkel, French President Emmanuel Macron and Irish leader Leo Varadkar. At this point, we’re not seeing any progress for May’s deal, in whatever amendment, to get enough vote from the parliament yet. But let’s see what she’ll say on Monday. Two central banks will meet this week, ECB and BoJ. At the meeting in December, ECB has already turned cautious by noting that risks are broadly balanced by moving to the downside. Since then, economic data remained weak. In particular, headline CPI slowed back to 1.6% yoy while core CPI was unchanged at 1.0%, showing no upward pressure. But for now, the deterioration in outlook is unlikely strong enough to prompt ECB to change its forward guidance yet. That is, ECB will likely maintain the wordings of keeping interest rates unchanged at present level at least through summer of 2019. Policymakers would probably wait for new economy projections in March first, before making any changes. On the other hand, BoJ will release new economic projections this week and we may see downward revision in inflation estimates. In December, Japan all item CPI slowed to 0.3% yoy, down from 0.8% yoy and matched expectation. Core CPI, all item ex-fresh food, slowed to 0.7% yoy, down from 0.9% yoy and missed expectation of 0.8% yoy. Core-core CPI, al item ex-fresh food, energy, stayed unchanged at 0.3% yoy. The data showed that even discounting the fall in energy prices, consumer inflation stayed week. And apparently, the recovery is not passed on to consumers. And business remained reluctant to raise prices. The data added to the case for BoJ to cut inflation forecasts. Back in October, BoJ projects core CPI to hit 1.4% in fiscal 2019 and then 1.5% in fiscal 2020. Such projections would be trimmed to reflect the decline in oil as well as global slowdown. As market sentiments improve, with further rebound in stocks, back-to-normal yield curve, and progress in US-China trade negotiations, we’d expect traders to start pricing in Fed’s rate hike again. They were rather pessimistic just two to three weeks ago, when the chance of a cut by December was higher than that of a hike. Hence, we’ll look for opportunity to buy Dollar ahead. Last week, we noted that buying Sterling was tempting on receding chance of no-deal Brexit. 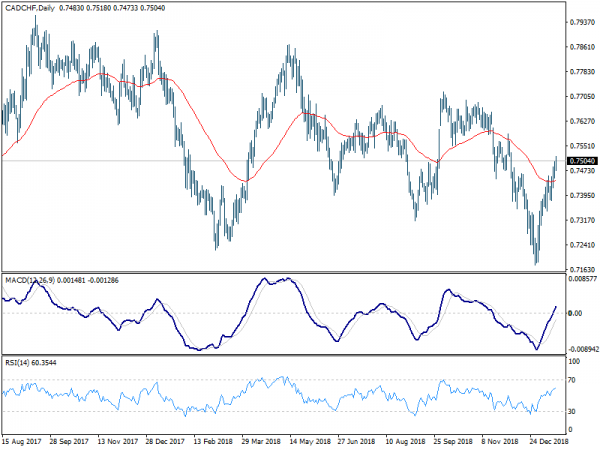 This week, selling Sterling also looks tempting as the rally lost momentum. But still, we’d avoid it as Brexit outcome remains unpredictable. USD/JPY’s rebound from 104.69 is extending and looks strong. But the structure still suggests it’s corrective. Thus, we’ll not long USD/JPY. 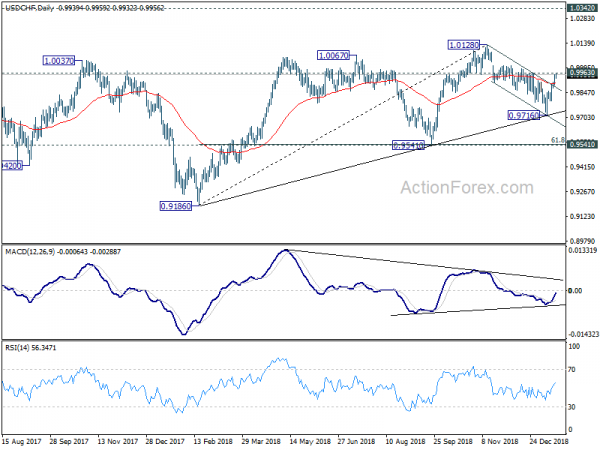 We’ll also avoid selling AUD/USD since downside will be limited should stock rebound continue. 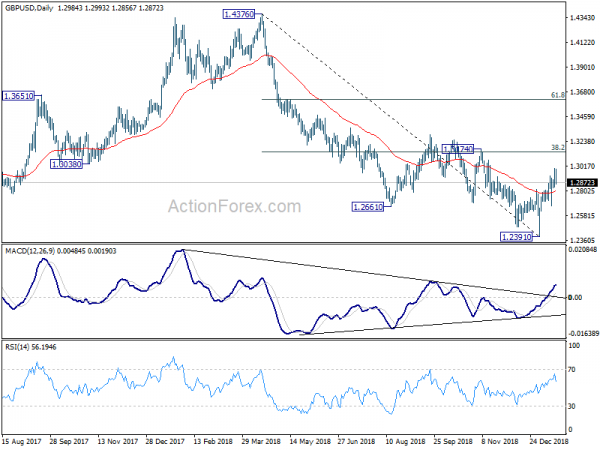 Comparing Euro and Swiss Franc, the Franc is the preferred one to sell as EUR/CHF drew support from 1.12 handle and it’s trying to extend the rebound. Actually, CAD/CHF long is a candidate too considering the strength in Loonie thanks to oil price rally. USD/CAD also stays near term bearish. But comparing USD/CHF and CAD/CHF, USD/CHF is in a clearer medium term rise. Hence, USD/CHF is preferred. 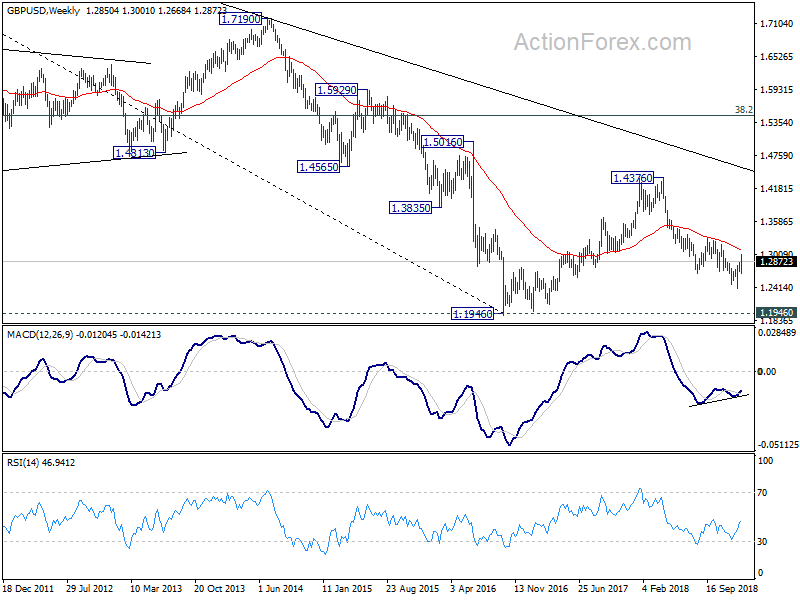 Taking a look at USD/CHF, firstly, structure of the fall from 1.0128 suggests that it’s corrective. Strong rebound from medium term trend line also suggests that medium term rise from 0.9186 is still in progress. 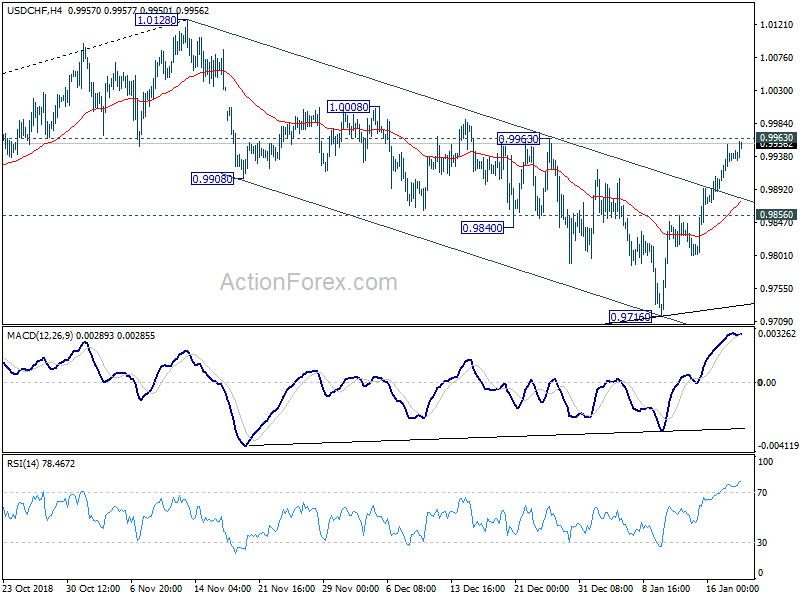 Last week’s break of near term channel resistance suggests that the correction is completed at 0.9716 already. And, larger rise might be ready to resume. Though, as USD/CHF is facing 0.9963 resistance and EUR/CHF retreated ahead of 1.1340/8, we’ll choose to buy USD/CHF on dip. 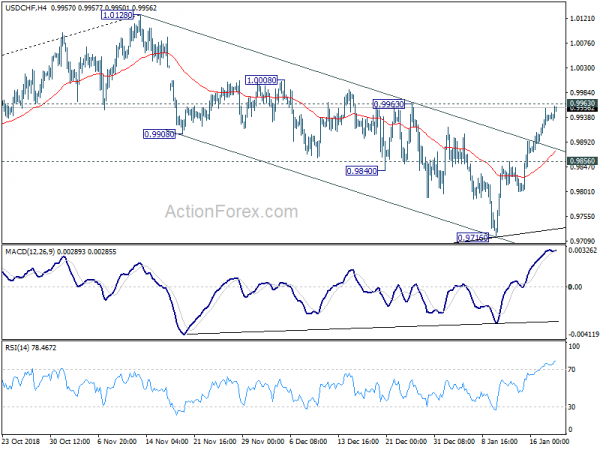 That is, we’ll buy USD/CHF at 0.9920 (mid-way between 0.9963 and 4 hour 55 EMA at 0.9876). Stop will be placed at 0.9825, below 0.9856 minor support. 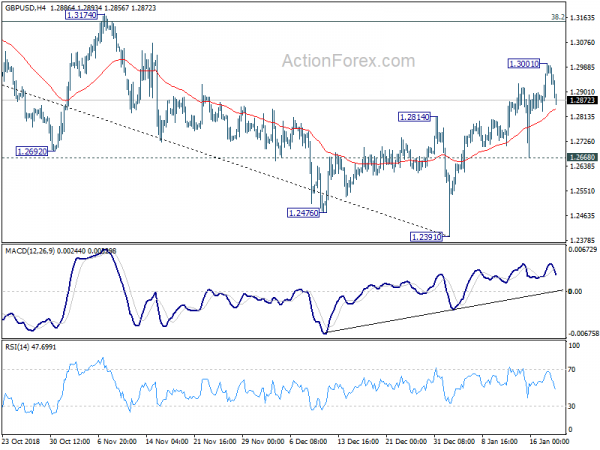 Target is placed at 1.0300, as we expect the upside to extend to take on 1.0342 resistance (2017 high). Risk/reward ratio is at 1:4 which is acceptable. 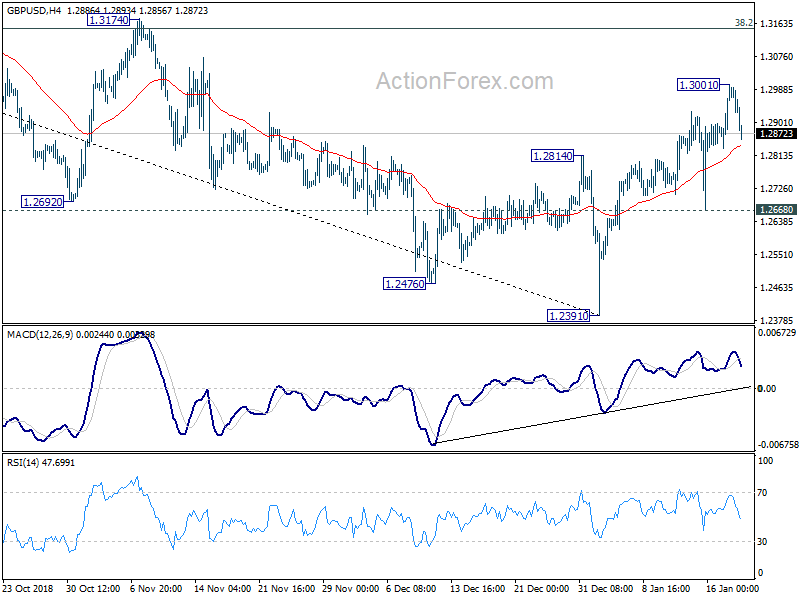 GBP/USD’s corrective rise from 1.2391 extended to 1.3001 last week but formed a temporary top there and retreated. Initial bias is neutral this week for some consolidations first. Further rally is expected as long as 1.2668 minor support holds. On the upside, above 1.3001 will target 1.3174 resistance, which is close to 38.2% retracement of 1.4376 to 1.2391 at 1.3149. We’d expect strong resistance from there to limit upside, at least on first attempt. On the downside, break of 1.2668 support will argue that such rebound is completed and turn bias back to the downside for retesting 1.2391 low. 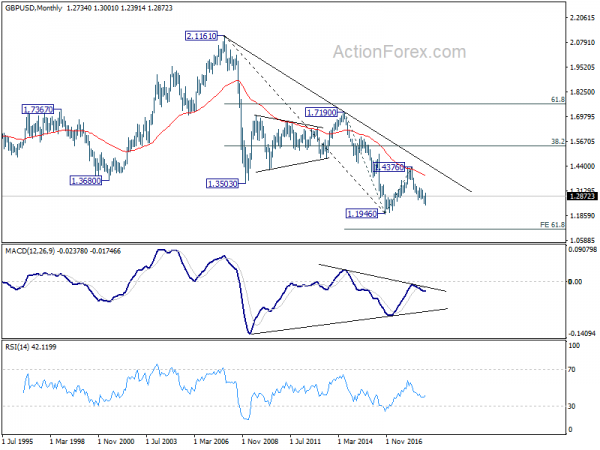 In the longer term picture, outlook in GBP/USD remains bearish. Rebound from 1.1946 was rejected solidly by falling 55 month EMA. The pair was limited well below 38.2% retracement of 2.1161 (2007 high) to 1.1946, as well as the decade long falling trend line. On break of 1.1946, next target will be 61.8% projection of 1.7190 to 1.1946 from 1.4376 at 1.1135.